I remember listening to North Carolinians Hour of 13 The Ritualist and recall generally appreciating the music while not being totally gaga over it. Something was to be said about solidity of their traditional doom metal, but the album did not keep me on edge. The eponymous release is where things started for the duo of Chad Davis and Phil Swanson and it is now being re-released on the doom imprint Eyes Like Snow. It is not hard to see that the band were always in the same doom vein (perhaps with tinges of occult, just read the song titles) bringing forth some Black Sabbath and The Obsessed riffery. I almost want to say I hear Paranoid slowed down on Call to Satan and Hex of Harm happens to be paying tributes to the Sabbath gods as well. It is hard not to get excited and sucked in from the very beginning of Submissive to Evil and Hex of Harm, where bass-guitar interplay is excellent and heaviness dominates. Endurement to the Heirs of Shame has a cool harmonious chorus, Grim Reality is somewhat playful, less heavy, hinting stoner rock. Missing Girl, on the other hand, adds distortion and drag, in a good sense of the word, while dealing with occult matters. Phil's voice fits the band perfectly, his vocals muscular enough for the underlying riffs, yet containing that certain Ozzy trace of tearfulness in his delivery. Allowance of Sin takes a different vocal approach, speaking in a preacher’s voice from the pulpit, only shifting later to grumbling guitars. 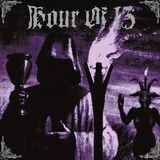 Where I still have problems with Hour of 13 is, as good as their riffs are, everything revolves around those 1-2 riffs and the songwriting never progresses beyond that point. The Correalation, for example holds a lot of promise but then the song goes very static, basically milling in one place. I could point to other places on this album where Hour of 13 reaches their comfort zone quickly and then basically does multiple repeats from there. So my, albeit subjective, verdict remains the same. Hour of 13 is a very respectable band, I just don't find their overall package extremely intoxicating.